FOXBORO, Ma. — In Super Bowl LI, the Patriots struggled early to run the ball with their big bruiser, LeGarrette Blount. 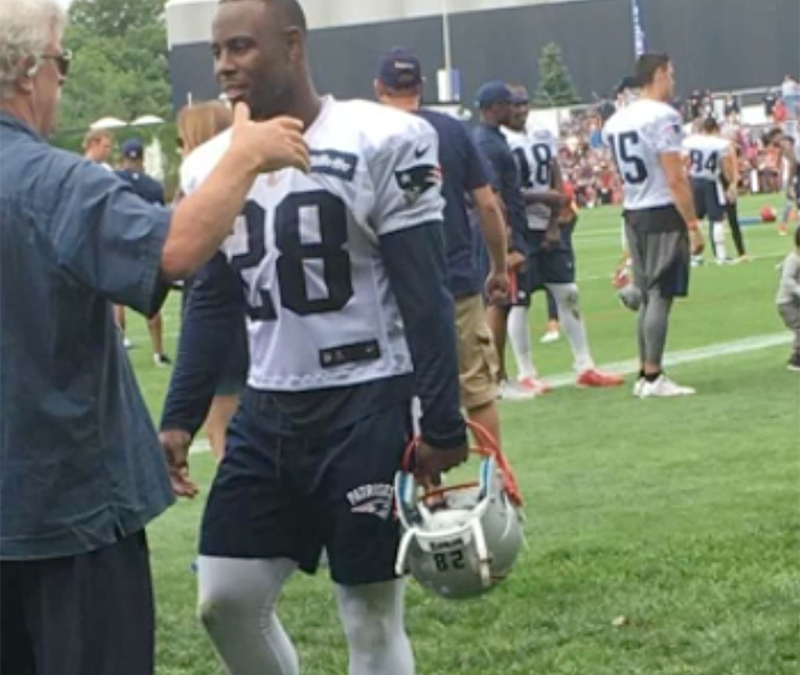 The team then swapped the traditional running back for smaller, more agile James White. White then played 72 percent of the team’s snaps, proving instrumental in the Patriots’ shocking comeback over the Atlanta Falcons, scoring three touchdowns. With the increase of passing and faster defensive talent, the NFL has gradually shifted toward fast elusive scatbacks like White. Once viewed as situational, role-type players, scatbacks today are often used as the focal running back. The Carolina Panthers’ selection of Christian McCaffrey with the eighth overall pick in the 2017 NFL Draft is the latest example of the trend. The 5-foot-11 McCaffrey, at 202 pounds, is known more for his speed (4.48 seconds in 40-yard dash), quickness and versatility rather than strength and power. “I think this is a guy that you can get the ball into his hands in many different ways and quick,” said Panthers head coach Ron Rivera at a press conference after the draft. Four spots above McCaffrey, the Jacksonville Jaguars took the now-uncommon, old-school approach, picking up Leonard Fournette (6-foot-1, 235 pounds), according to ESPN NFL Insider Scott Kacsmar. According to statistical research done by Inside The Pylon’s Dave Archibald, seven teams clearly used specialized roles for running backs during the 2015 NFL season, including the Patriots, who benefited from scatbacks more than any team. Besides White, New England also employed Shane Vereen in this role during Super Bowl XLIX and Danny Woodhead in Super Bowl XLVI in 2011 as well as Kevin Faulk and J.R. Redmond in four Super Bowl appearances during the 2000s. “Whenever the game was on the line, whenever we weren’t running in between the guards, I was in the game,” Redmond said. For the 2001 Patriots, the season was on the line in Super Bowl XXXVI when Brady, Redmond and the rest of the players on the field took the huddle tied 17-17 witih the St. Louis Rams with 1:21 to play. Brady’s next three completions were to Redmond, who fought his way out of bounds at the Patriots’ 41-yard line on his third catch, stopping the clock at 33 seconds. Brady completed two more passes downfield to Troy Brown and Jermaine Wiggins, before Adam Vinatieri nailed the game-winning 48-yard field goal. The usage of Redmond set the tone for scatbacks in future Patriots’ Super Bowls, leading up to White’s performance in February. But the Patriots were not the first team to invent the position. Its origin dates back to 1983, when Washington Redskins head coach Joe Gibbs utilized Nick Giaquinto as the first H-Back (offensive back who lines up in the slot) in NFL History. It was part of an innovative strategy implemented by a team that had won the Super Bowl the year prior. In college, Giaquinto was a primary back at the University of Connecticut, running the ball 20 to 30 times per game. He still holds the school’s single-game rushing record — 277 yards versus Holy Cross in 1976. At 205 pounds, Giaquinto wasn’t puny. But he was more of a finesse, all-purpose player who could catch and run the ball. Gibbs called him “The Trashman” for his ability to fill a number of roles, when needed, and clean up the team’s messy situations. In 1983, Giaquinto produced a statline that was unique for a running back. He was much more of a threat in the passing game, garnering a career-high 372 yards on 27 receptions, with just 53 rushing yards on 14 carries. That trend has now leaked into the college game, with teams running more pro-style offenses with scatbacks and slot receivers. Teams of all leagues are always looking for a new advantage, and Wrighster says that’s why scatbacks provide an advantage that’s similar to that of the defending NBA champions. In June, The Warriors won their second NBA championship in three seasons. New England has won two of the past three Super Bowls, and five championships since 2001 in part by implementing scatbacks more than just situationally. It’s no wonder more teams are following suit.